Brown species of Lactarius are often frustratingly difficult to identify, but Lactarius gerardii--as traditionally defined--is fairly easily distinguished by its distant white gills, which run down the stem; its white, unchanging milk; its white spore print; its failure to stain or bruise; and its mild or merely slightly acrid taste. It has a rugged, yellowish brown to grayish brown cap that is often described as "velvety," but in my experience the texture of the fresh, mature cap might be better described as "waxy." What I mean is, when you rub your thumb or fingertip over the cap surface it does not feel at all velvety or suedelike, but glossy and softly slick--very different from the finely velvety feel of, for example, Lactarius lignyotus. Recent molecular results from Stubbe and collaborators (2010) have turned "Lactarius gerardii" into your worst nightmare, if you're the kind of person who demands certainty and/or easy mushroom identification. The authors studied gerardii-like collections from across the globe and found "[t]hirty strongly supported clades . . . of which 18 are morphologically identifiable species." They elevate the gerardii group to the level of subgenus (!) and confirm, for North America, five gerardii-like species. Three of these appear to line up with traditional morphological species: Lactarius gerardii var. fagicola, Lactarius subgerardii, and Lactarius petersenii. 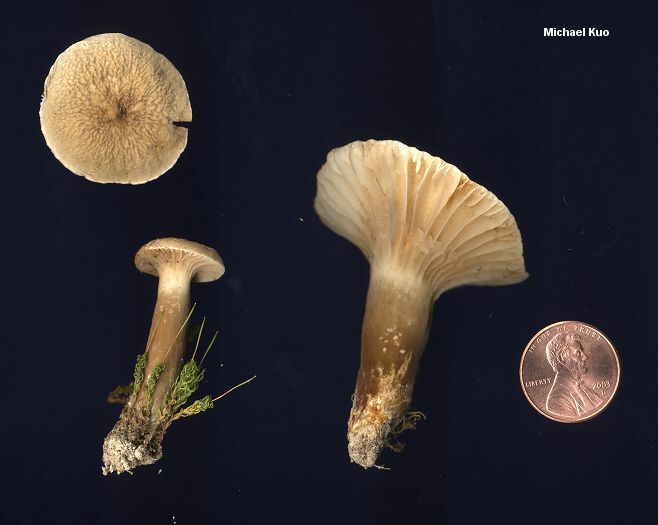 The problem is, the other two phylogenetic species represent hodge-podges containing (with no rhyme or reason) specimens identified as Lactarius gerardii, Lactarius atro-olivaceus, and Lactarius gerardii var. subrubescens. Apparently, the pink to red staining that ostensibly separated var. subrubescens does not predict genetic difference and, more troubling, the morphological features mycologists have traditionally analyzed are thoroughly unable to separate the two species, which are so divergent that two Asian gerardii-like species actually lie between them on the evolutionary tree! Thus the mushrooms described and illustrated here represent one of two species (or both of them?) --species that can't be separated without DNA testing. 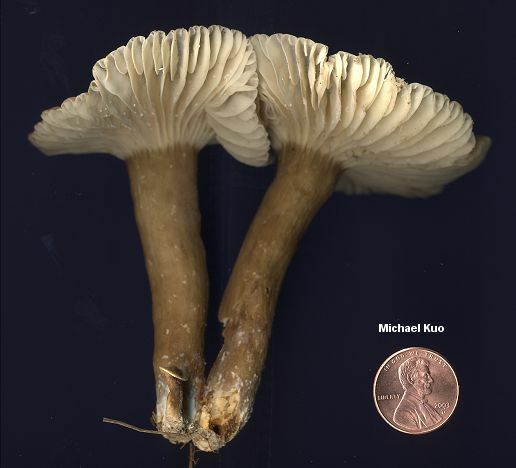 One of the two species is actually Lactarius gerardii as it was originally described from New York by Peck (1873)--but we may never know which, since researchers are unlikely to be able to extract informative DNA out of Peck's specimens over 100 years later. Lactarius gerardii var. 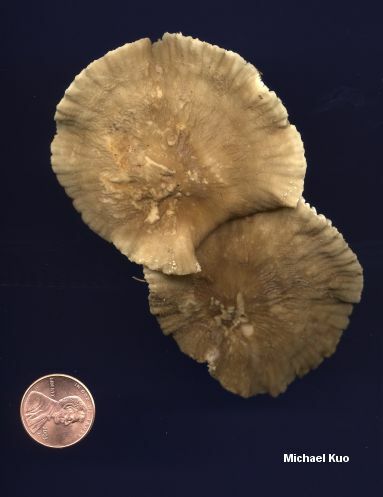 fagicola (which appears to be a "good" taxon and should be elevated to species, according to recent studies; see above) differs in its brown-staining gills and flesh; it is recorded under beech in Michigan and Tennessee. Lactarius subgerardii (apparently "good") associates with eastern hemlock, tastes very acrid, and is very small (3 cm across at most). Lactarius gerardii var. 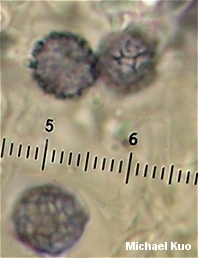 subrubescens (apparently not phylogenetically different) stains reddish, and has shorter spore ornamentation; it is recorded from Maine to Costa Rica. Ecology: Mycorrhizal with hardwoods (especially oaks); also sometimes reported under conifers; growing alone, scattered, or gregariously; summer and fall; widely distributed east of the Great Plains, and extending at least as far south as Costa Rica. Cap: 3-10.5 cm; convex with a small point in the middle, becoming flat with an uplifted margin, with the central point often disappearing; dry; usually described as finely velvety (but see comments above); often with a rugged and wrinkled surface; yellow-brown to grayish brown; the margin sometimes becoming scalloped. 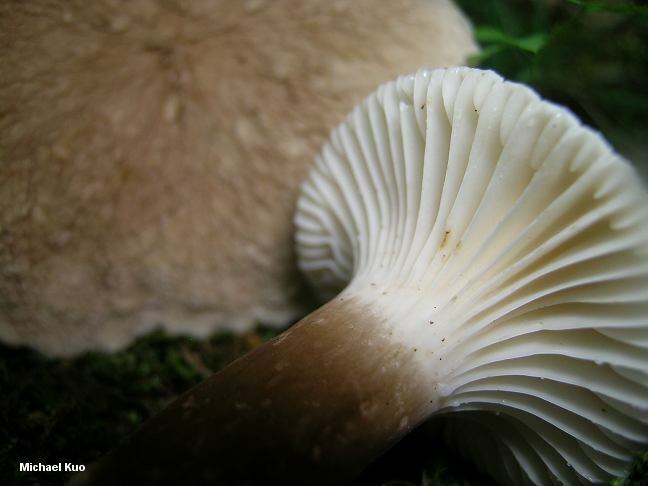 Gills: Running down the stem; quite distant; stark white. 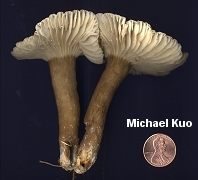 Stem: 3-8 cm long; 1-2.5 cm thick; more or less equal; dry; without potholes; textured and colored like the cap; sometimes with a white apex, or sometimes with the gills running into the brown coloration; becoming hollow. Flesh: White; thin; somewhat brittle. Milk: White; unchanging on exposure to air; not staining tissues. Odor and Taste: Odor not distinctive; taste mild or slightly acrid. Chemical Reactions: KOH on cap surface negative; on flesh yellowish. Microscopic Features: Spores 7-10 x 7.5-9 µ; globose to subglobose; ornamentation 0.5-0.8 µ high, as amyloid warts and ridges forming partial or complete reticula. Pleuromacrocystidia absent, or present as scattered clavate elements slightly projecting. Cheilocystidia inconspicuous; cylindric. 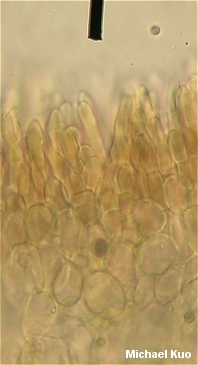 Pileipellis a trichoepithelium; terminal cells long and cystidium-like; brown in KOH. REFERENCES: Peck, 1873, (Saccardo, 1887; Coker, 1918; Hesler & Smith, 1979; Smith, Smith & Weber, 1979; Phillips, 1991/2005; Lincoff, 1992; Roody, 2003; McNeil, 2006; Binion et al., 2008.) Herb. Kuo 08050305, 07230406, 07160705, 06280805.